Work is the best treatment we have for serious mental illness (i.e., people with schizophrenia spectrum disorder, bipolar, or depression). Two-thirds of people with serious mental illness want to work but only 15% are employed. They see work as an essential part of recovery. Being productive is a basic human need. Working can both be a way out of poverty and prevent entry into the disability system. Competitive employment has a positive impact on self-esteem, life satisfaction, and reducing symptoms (Luciano, Bond, & Drake, 2014). Until the 1990s, no models were effective in helping people with serious mental illness get stable competitive employment. Even today, only 2% of people who could benefit have access to effective employment services. The number of studies showing IPS effectiveness continues to grow. To date, 25 randomized controlled trials of IPS (See Recommended Readings below) have showed a significant advantage for IPS. 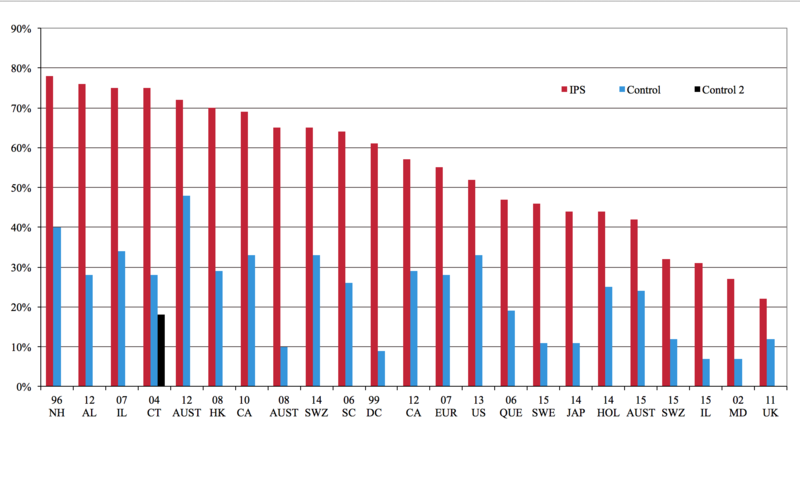 Across the 25 studies, IPS showed an average competitive employment rate of 56% compared to 23% of controls. A meta-analysis of 17 randomized controlled trials found that people receiving IPS services were 2.4 times more likely to be employed than controls (Modini, 2016). People in IPS attain employment faster, hold their jobs for longer, and work more hours. In 4 randomized controlled trials, over an 18-month period, approximately 3 times as many people receiving IPS services achieved employment and worked more hours, and people receiving IPS services worked overall four times as many hours compared to controls. IPS is more effective than alternative vocational approaches regardless of a variety of client background factors (e.g., ethnicity, gender, socioeconomic status). Researchers continue to explore the applicability of IPS in target subgroups and new populations. McGovern, M., McHugo, G.J., Drake, R.E., Bond, G.R., Merrens, M. (2013). 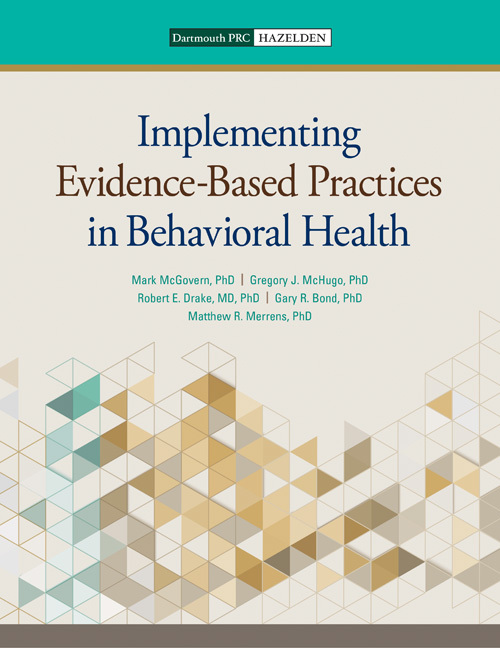 Implementing Evidence-based Practices in Behavioral Health Programs. Center City, MN: Hazelden Press. Swanson, S.J., & Becker, D.R. (2013). IPS supported employment: A practical guide. Lebanon, NH: Dartmouth Psychiatric Research Center. Drake, R.E., Bond, G.R., & Becker, D.R. (2012). 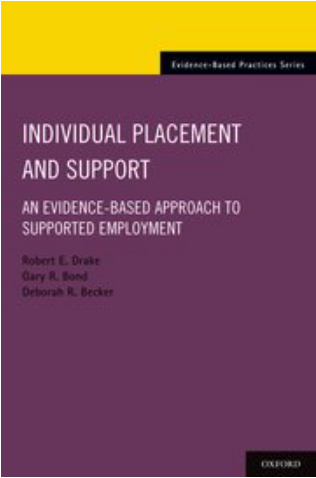 Individual Placement and Support: An evidence-based approach to supported employment. New York: Oxford University Press. Becker, D.R., Swanson, S., Bond, G.R., & Merrens, M.R. (2011). Evidence-based supported employment fidelity review manual (2nd. Ed.). Lebanon, NH: Dartmouth Psychiatric Research Center. Bejerholm, U., Areberg, C., Hofgren, C., Sandlund, M., & Rinaldi, M. (2014). Individual Placement and Support in Sweden—a randomized controlled trial. Nordic Journal of Psychiatry, 69, 57-66. Bond, G. R., Kim, S. J., Becker, D. R., Swanson, S. J., Drake, R. E., Krzos, I. M., . . . Frounfelker, R. L. (2015). A controlled trial of supported employment for people with severe mental illness and justice involvement. Psychiatric Services, 66, 1027-1034. Bond, G. R., Salyers, M. P., Dincin, J., Drake, R. E., Becker, D. R., Fraser, V. V., & Haines, M. (2007). A randomized controlled trial comparing two vocational models for persons with severe mental illness. Journal of Consulting and Clinical Psychology, 75, 968-982. Burns, T., Catty, J., Becker, T., Drake, R. E., Fioritti, A., Knapp, M., . . . Wiersma, D. (2007). The effectiveness of supported employment for people with severe mental illness: A randomised controlled trial. Lancet, 370, 1146-1152. Davis, L. L., Leon, A. C., Toscano, R., Drebing, C. E., Ward, L. C., Parker, P. E., . . . Drake, R. E. (2012). A randomized controlled trial of supported employment among veterans with posttraumatic stress disorder. Psychiatric Services, 63, 464–470. Drake, R. E., Frey, W. D., Bond, G. R., Goldman, H. H., Salkever, D. S., Miller, A. L., . . . Milford, R. (2013). Assisting Social Security Disability Insurance beneficiaries with schizophrenia, bipolar disorder, or major depression in returning to work. American Journal of Psychiatry, 170, 1433-1441. Drake, R. E., McHugo, G. J., Bebout, R. R., Becker, D. R., Harris, M., Bond, G. R., & Quimby, E. (1999). A randomized clinical trial of supported employment for inner-city patients with severe mental illness. Archives of General Psychiatry, 56, 627-633. Drake, R. E., McHugo, G. J., Becker, D. R., Anthony, W. A., & Clark, R. E. (1996). The New Hampshire study of supported employment for people with severe mental illness: Vocational outcomes. Journal of Consulting and Clinical Psychology, 64, 391-399. Gold, P. B., Meisler, N., Santos, A. B., Carnemolla, M. A., Williams, O. H., & Kelleher, J. (2006). Randomized trial of supported employment integrated with assertive community treatment for rural adults with severe mental illness. Schizophrenia Bulletin, 32, 378-395. Heslin, M., Howard, L., Leese, M., McCrone, P., Rice, C., Jarrett , M., . . . Thornicroft, G. (2011). Randomized controlled trial of supported employment in England: 2 year follow-up of the Supported Work and Needs. World Psychiatry, 10, 132-137. Hoffmann, H., Jäckel, D., Glauser, S., Mueser, K. T., & Kupper, Z. (2014). Long- term effectiveness of supported employment: five-year follow-up of a randomized controlled trial. American Journal of Psychiatry, 171, 1183-1190. Killackey, E. J., Allott, K. A., Cotton, S. M., Chinnery, G. L., Sun, P., Collins, Z., . . . Jackson, H. J. (2012). Vocational recovery in first episode psychosis: First results from a large controlled trial of IPS. Early Intervention in Psychiatry, 6(Supplement 1), 13. Killackey, E. J., Jackson, H. J., & McGorry, P. D. (2008). Vocational intervention in first-episode psychosis: individual placement and support v. treatment as usual. British Journal of Psychiatry, 193, 114-120. Latimer, E., Lecomte, T., Becker, D., Drake, R., Duclos, I., Piat, M., . . . Xie, H. (2006). Generalisability of the individual placement and support model of supported employment: Results of a Canadian randomised controlled trial. British Journal of Psychiatry, 189, 65-73. Lehman, A. F., Goldberg, R. W., Dixon, L. B., McNary, S., Postrado, L., Hackman, A., & McDonnell, K. (2002). Improving employment outcomes for persons with severe mental illness. Archives of General Psychiatry, 59, 165-172. Michon, H. W., van Vugt, M., Stant, D. A., van Vugt, M. D., van Weeghel , J., & Kroon, H. (2014). Effectiveness of Individual Placement and Support for people with severe mental illness in the Netherlands: a 30-month randomized controlled trial Psychiatric Rehabilitation Journal, 37, 129-136. Mueser, K. T., Clark, R. E., Haines, M., Drake, R. E., McHugo, G. J., Bond, G. R., . . . Swain, K. (2004). The Hartford study of supported employment for persons with severe mental illness. 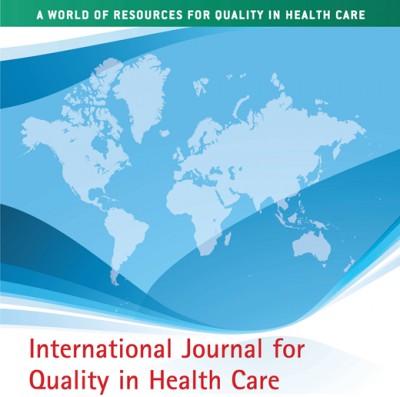 Journal of Consulting and Clinical Psychology, 72, 479–490. Nuechterlein, K. H. (2010). Successful return to work or school in recent- onset schizophrenia: The UCLA randomized controlled trial of Individual Placement and Support. Schizophrenia Research, 117, 133. Oshima, I., Sono, T., Bond, G. R., Nishio, M., & Ito, J. (2014). A randomized controlled trial of Individual Placement and Support in Japan. Psychiatric Rehabilitation Journal, 37, 137-143. Tsang, H. W., Chan, A., Wong, A., & Liberman, R. P. (2009). Vocational outcomes of an integrated supported employment program for individuals with persistent and severe mental illness. Journal of Behavior Therapy and Experimental Psychiatry, 40, 292-305. Twamley, E. W., Vella, L., Burton, C. Z., Becker, D. R., Bell, M. D., & Jeste, D. V. (2012). The efficacy of supported employment for middle-aged and older people with schizophrenia. Schizophrenia Research, 135, 100-104. Viering, S., Jäger, M., Bärtsch, B., Nordt, C., Rössler, W., Warnke, I., & Kawohl, I. W. (2015). Supported employment for the reintegration of disability pensioners with mental illnesses: a randomized controlled trial. Frontiers in Public Health, http://dx.doi.org/10.3389/fpubh.2015.00237. Waghorn, G. R., Dias, S., Gladman, B., Harris, M., & Saha, S. (2014). A multi-site randomised controlled trial of evidence-based supported employment for adults with severe and persistent mental illness. Australian Occupational Therapy Journal, 6, 424-436. Wong, K. K., Chiu, R., Tang, B., Mak, D., Liu, J., & Chiu, S. N. (2008). A randomized controlled trial of a supported employment program for persons with long-term mental illness in Hong Kong. Psychiatric Services, 59, 84-90. Davis, L. L., Kyriakides, T. C., Suris, A. M., Ottomanelli, L. A., Mueller, L., Parker, P. E., . . . Drake, R. E. (2018). Effect of evidence-based supported employment vs transitional work on achieving steady work among veterans with posttraumatic stress disorder: a randomized clinical trial. JAMA Psychiatry, 75, 316-324. Addington, D., Noel, V. A., & Bond, G. R. (2018). Assessing fidelity to coordinated specialty care for first episode psychosis in the US Federal Block Grant Program with the First Episode Psychosis Fidelity Scale. Early Intervention in Psychiatry, 12 (Suppl 1), 215. Bond, G. R. (2018). Evidence-based policy strategies: a typology. Clinical Psychology: Science and Practice, 25(4), e12267. https://doi.org/12210.11111/cpsp.12267. Drake, R. E., Bond, G. R., & Becker, D. R. (2018). Introducing IPS supported employment in Japan. Psychiatry and Clinical Neurosciences, doi: 10.1111/pcn.12792. Drake, R.E., Becker, D.R., & Bond, G.R. Introducing IPS supported employment in Japan. Psychiatry and Clinical Neurosciences. 2018. Advance online publication. doi: 1.1111/pcn.12792. Metcalfe, J. D., Drake, R. E., & Bond, G. R. (2018). Economic, labor, and regulatory moderators of the effect of Individual Placement and Support among people with severe mental illness: a systematic review and meta-analysis. Schizophrenia Bulletin, 44, 22-31. Metcalfe, J. D., Drake, R. E., & Bond, G. R. (2018). The use of standardized discharge in IPS supported employment programs. Psychiatric Services, 69, 476-478. Metcalfe, J. D., Riley, J., McGurk, S., Hale, T., Drake, R. E., & Bond, G. R. (2018). Comparing predictors of employment in Individual Placement and Support: a longitudinal analysis. Psychiatry Research, 264, 85-90. Noel, V. A., Oulvey, E., Drake, R. E., Bond, G. R., Carpenter-Song, E. A., & DeAtley B. (2018). A preliminary evaluation of Individual Placement and Support for youth with developmental and psychiatric disabilities. Journal of Vocational Rehabilitation, 48, p. 249-255. Baller, J., Blyler, C., Bronnikov, S., Xie, H., Bond, G. R., Filion, K., & Hale, T. (2017). Long-term follow-up of the Mental Health Treatment Study. Paper presented at the 5th Annual Meeting of the Disability Research Consortium, Washington, DC. Bond, G. R., & Drake, R. E. (2017). New directions for psychiatric rehabilitation in the USA. Epidemiology and Psychiatric Sciences, 26, 223-227. Bond, G. R., & Drake, R. E. (2017). Special Issue: New Research on IPS Supported Employment. Administration and Policy in Mental Health and Mental Health Services Research, 44(3). Bond, G. R., Johnson-Kwochka, A. V., Becker, D. R., Drake, R. E., & Greene, M. A. (2017). Sustaining and expanding evidence-based supported employment: the role of state leaders participating in a learning community. Administration and Policy in Mental Health and Mental Health Services Research, 44, 320-330. Bond, G. R., Lerner, D. R., & Drake, R. E. (2017). Final report: Work-focused interventions for depression, Contract # ASPE/DALTCP, HHSP23320100026WI. In. 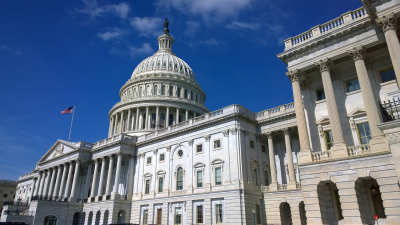 Washington, DC: Assistant Secretary for Planning and Evaluation, Health and Human Services. Drake, R. E., & Bond, G. R. (2017). Individual Placement and Support: penetration and new populations. Administration and Policy in Mental Health and Mental Health Services Research, 44, 309–310. Drake, R. E., Bond, G. R., & Ben-Zeev, D. (2017). Psychiatric rehabilitation. In B. J. Sadock, V. A. Sadock, & P. Ruiz (Eds. ), Comprehensive Textbook of Psychiatry (10th ed.). Philadelphia: Lippincott Williams & Wilkins. Johnson-Kwochka, A., Bond, G. R., Becker, D. R., Drake, R. E., Greene, M. A. (2017). Prevalence and quality of Individual Placement and Support (IPS) supported employment in the United States. Administrative Policy in Mental Health. PMID: 28062932. Lones, C. E., Bond, G. R., McGovern, M. P., Carr, K., Leckron-Myers, T., Hartnett, T., Becker, D. R. (2017). Individual Placement and Support (IPS) for methadone maintenance therapy patients: A pilot randomized controlled trial. Administrative Policy in Mental Health. PMID: 28213673. McLaren, J., Lichtenstein, J., Lynch, D., Becker, D.R., & Drake, R. Individual Placement and Support for people with autism spectrum disorders: A pilot program. Administration and Policy in Mental Health, 2017, 44, 365-373. Noel, V. A., Oulvey, E., Drake, E. E., & Bond, G. R. (2017). Barriers to employment for transition-age youth with developmental and psychiatric disabilities. Administration and Policy in Mental Health and Mental Health Services Research, 44, 354–358. Rössler, W., Drake, R. E. (2017). Psychiatric rehabilitation in Europe. Epidemiology and Psychiatric Sciences. PMID: 28100293. Sveinsdottir, V., & Bond, G. R. (2017). Barriers to employment for people with severe mental illness and criminal justice involvement. Journal of Mental Health, http://dx.doi.org/10.1080/09638237.2017.1417556. Swanson, S. J., Becker, D. R., Bond, G. R., & Drake, R. E. (2017). 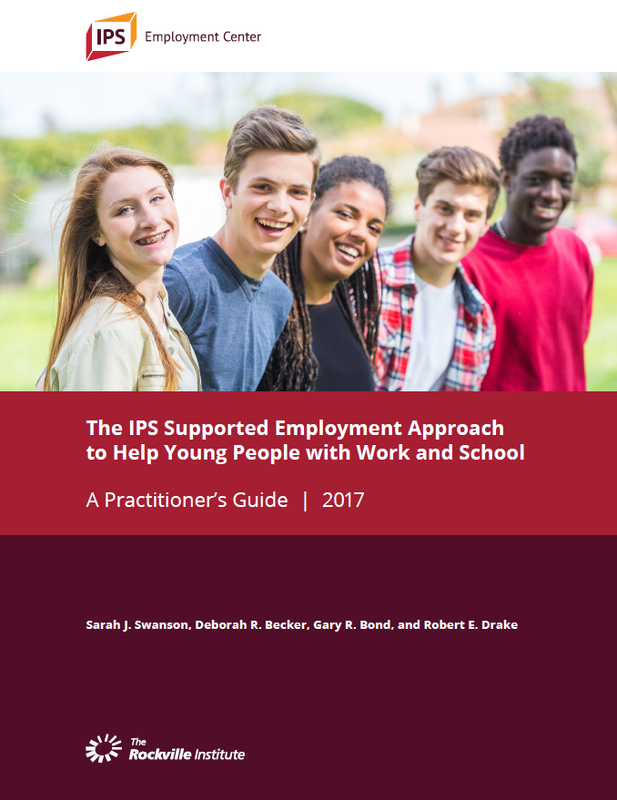 The IPS supported employment approach to help young people with work and school: a practitioner’s guide. Rockville, MD: IPS Employment Center, Westat. Swarbrick, M., Wilson, L., Becker, D., Swanson, S. J., Langfitt-Reese, S., & Bond, G. R. (2017). The role of the family advocacy teams. Journal of Vocational Rehabilitation, 47, 13-17. Addington, D. E., Norman, R., Bond, G. R., Sale, T., Melton, R., McKenzie, E., Wang, J. (2016). Development and Testing of the First-Episode Psychosis Services Fidelity Scale. Psychiatric Services PMID: 27032665. Bond, G. R. (2016). Individual Placement and Support (IPS) supported employment. Oxford Bibliographies in Social Work, DOI: 10.1093/OBO/9780195389678-0202. Bond, G. R., Drake, R. E. (2016). New directions for psychiatric rehabilitation in the USA. Epidemiology and Psychiatric Sciences. PMID: 27866508. Bond, G. R., Drake, R. E., Becker, D. R., & Noel, V. A. (2016). Sustaining IPS supported employment services: The IPS Learning Community. World Psychiatry, 15, 81-83. Bond, G. R., Drake, R. E., Becker, D. R., & Noel, V. A. (2016). 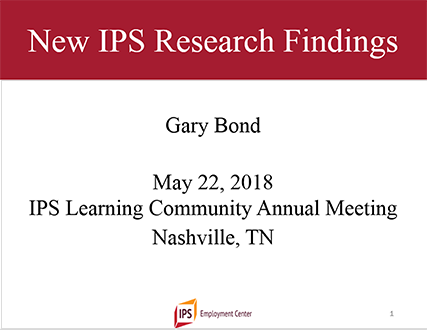 The IPS Learning Community: a longitudinal study of sustainment, quality, and outcome. Psychiatric Services. PMID: 27032661. Bond, G. R., Drake, R. E., Campbell, K. (2016). Effectiveness of Individual Placement and Support supported employment for young adults. Early Intervention Psychiatry. PMID: 25138195. Drake, R. E. The future of psychiatric rehabilitation. (2016). Epidemiology and Psychiatric Sciences. PMID: 27974082. Drake, R. E., Bond, G. R., Goldman, H. H., Hogan, M. F., Karakus, M. (2016). Individual Placement And Support services boost employment for people with serious mental illnesses, but funding is lacking. (2016). Health Affairs (Millwood). PMID: 27269028. Drake, R.E., Frey, W., Karakus, M., Salkever, D., Bond, G. R., Goldman, H. H. (2016). Policy implications of the Mental Health Treatment Study. Psychiatric Services. PMID: 27247172. Glynn, S. M., Marder, S. R., Noordsy, D. L., O’Keefe, C., Becker, D. R., Drake, R. E., Sugar, C. A. (2016). An RCT evaluating the effects of skills training and medication type on work outcomes among patients with schizophrenia. Psychiatric Services. PMID: 27799019. Luciano, A., Metcalfe, J. D., Bond, G. R., Xie, H., Miller, A. L., Riley, J., O’Malley, A. J., Drake, R. E. (2016). Hospitalization risk before and after employment among adults with schizophrenia, bipolar disorder, or major depression. Psychiatric Services. PMID: 27247173. Metcalfe, J. D., Drake, R. E., Bond, G. R. (2016). Predicting employment in the Mental Health Treatment Study: Do client factors matter? Administrative Policy in Mental Health. PMID: 27853950. Mueser, K. T., Drake, R. E., Bond, G. R. (2016). Recent advances in supported employment for people with serious mental illness. Current Opinion in Psychiatry. PMID: 27027464. Nicholson, J., Carpenter-Song, E. A., MacPherson, L. H., Tauscher, J. S., Burns, T. C., Lord, S. E. (2016). Developing the WorkingWell mobile app to promote job tenure for individuals with serious mental illnesses. Psychiatric Rehabilitation. PMID: 27322395. Noel, V. A., Bond, G. R., Drake, R. E., Becker, D. R., McHugo, G. J., Swanson, S. J., Luciano, A. E., Greene, M. A. (2016). Barriers and facilitators to sustainment of an evidence-based supported employment program. Administrative Policy in Mental Health. PMID: 27891567. Sveinsdottir, V., Tveito, T. H., Bond, G. R., Grasdal, A. L., Lie, S. A., Reme, S. E. (2016). Protocol for the SEED-trial: Supported employment and preventing early disability. BMC Public Health. PMID: 27422271. Becker, D. R. (2015). Hiring peers as vocational specialists. Psychiatric Services, 66(4), 337. doi:10.1176/appi.ps.660402. Bond, G. R., Drake, R. E., Luciano, A. (2015). Employment and educational outcomes in early intervention programmes for early psychosis: a systematic review. Epidemiol Psychiatr Sci. 24(5):446-457. PMID: 25016950. Bond, G. R., Kim, S. J., Becker, D. R., Swanson, S. J., Drake, R. E., Krzos, I. M., Fraser, V. V., O’Neill, S., & Frounfelker, R. L. A controlled trial of supported employment for people with severe mental illness and justice involvement. Psychiat Serv. 0(0), appi.ps.201400510. doi:10.1176/appi.ps.201400510. Kane, J. M., Schooler, N. R., Marcy, P., Correll, C. U., Brunette, M. F., Mueser, K. T., Rosenheck, R. A., Addington, J., Estroff, S. E., Robinson, J., Penn, D. L., & Robinson, D. G. (2015). The RAISE Early Treatment Program for first-episode psychosis: background, rationale, and study design. Journal of Clinical Psychiatry, 76(3), 76(3), 240-246. Doi: 10.4088/JCP.14m09289. McGurk, S. R., Mueser, K. T., Xie, H., Welsh, J., Kaiser, S., Drake, R. E., Becker, D. R., Bailey, E., Fraser, G., Wolfe, R., & McHugo, G. J. Cognitive enhancement treatment for people with mental illness who do not respond to supported employment: a randomized controlled trial. American Journal of Psychiatry, 0(0), appi.ajp.2015.14030374. doi:10.1176/appi.ajp.2015.14030374. Milfort, R., Bond, G. R., McGurk, S. R., Drake, R. E. (2015). Barriers to Employment Among Social Security Disability Insurance Beneficiaries in the Mental Health Treatment Study. Psychiatr. Serv. appips201400502. PMID: 26325458. Mueser, K. T., Penn, D. L., Addington, J., Brunette, M. F., Gingerich, S., Glynn, S. M., Lynde, D. W., Gottlieb, J. D., Meyer-Kalos, P., McGurk, S. R., Cather, C., Saade, S., Robinson, D. G., Schooler, N. R., Rosenheck, R. A., & Kane, J. M. (2015). The NAVIGATE program for first-episode psychosis: rationale, overview, and description of psychosocial components. Psychiatric Services, appips201400413. doi: 10.1176/appi.ps.201400413. Poremski D, Whitley R, Latimer E. Building trust with peo ple receiving supported employment and housing first services. Psychiatr Rehabil J. Mar 30 2015. PMID:25821980. doi:10.1037/prj0000137. Bond, G. R., & Drake, R. E. (2014). Making the case for IPS supported employment. Administration and Policy in Mental Health, 41(1), 69-73. Bond, G. R., Drake, R. E., & Campbell, K. (2014). Effectiveness of individual placement and support supported employment for young adults. Early Interv Psychiatry. PMID:25138195. Bond, G. R., Drake, R. E., & Luciano, A. (2014). Employment and educational outcomes in early intervention programmes for early psychosis: a systematic review. Epidemiol Psychiatr Sci, 1-12. PMID:25016950. Bond, G. R., Drake, R. E., McHugo, G. J., Peterson, A. E., Jones, A. M., & Williams, J. (2014). Long-term sustainability of evidence-based practices in community mental health agencies. Administration and Policy in Mental Health, 41(2), 228-236. PMID:23266661. Cohen, M. J., & Becker, D. R. (2014). Family advocacy for the IPS supported employment project: accomplishments and challenges. Psychiatr Rehabil J, 37(2), 148-150. PMID:24660944. Corbière, M., Villotti, P., Lecomte, T., Bond, G. R., Lesage, A., & Goldner, E. M. (2014). Work accommodations and natural supports for maintaining employment. Psychiatr Rehabil J, 37(2), 90-98. PMID:24512481. Davis, L. L., Pilkinton, P., Poddar, S., Blansett, C., Toscano, R., & Parker, P. E. (2014). Impact of social challenges on gaining employment for veterans with posttraumatic stress disorder: An exploratory moderator analysis. Psychiatr Rehabil J, 37(2), 107-109. PMID:24708195. Drake, R. E., & Becker, D. R. (2014). Robert Liberman’s influence on supported employment. Am J Psychiatr Rehabil, 17(3), 193-196. PMID:1627951521; 2014-39488-003. Drake, R. E., & Bond, G. R. (2014). Introduction to the special issue on individual placement and support. Psychiatr Rehabil J, 37(2), 76-78. PMID:24912057. Druss, B. G. (2014). Supported employment over the long term: from effectiveness to sustainability. American Journal of Psychiatry, 171, 1142-1144. 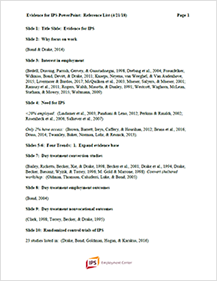 Ellison, M. L., Klodnick, V. V., Bond, G. R., Krzos, I. M., Kaiser, S. M., Fagan, M. A., Davis, M. (2014). Adapting supported employment for emerging adults with serious mental health conditions. Journal of Behavioral Health Services and Research, 42(2):206-22. PMID:25391357. Fioritti, A., Burns, T., Hilarion, P., van Weeghel, J., Cappa, C., Sunol, R., & Otto, E. (2014). Individual placement and support in Europe. Psychiatr Rehabil J, 37(2), 123-128. PMID:24912061. Haslett, W. R., Mc Hugo, G. J., Bond, G. R., & Drake, R. E. (2014). Use of software for tablet computers to promote engagement with supported employment: results from an RCT. Psychiatric Services, 65(7), 954-956. Hoffmann, H., Jackel, D., Glauser, S., Mueser, K. T., & Kupper, Z. (2014). Long- term effectiveness of supported employment: 5-year follow-up of a randomized controlled trial. American Journal of Psychiatry. PMID:25124692. Hogan, M. F., Drake, R. E., & Goldman, H. H. (2014). A national campaign to finance supported employment. Psychiatr Rehabil J, 37(2), 73-75, PMID:24912056. Jones, A. M., Bond, G. R., Peterson, A. E., Drake, R. E., McHugo, G. J., & Williams, J. R. (2014). Role of state mental health leaders in supporting evidence-based practices over time. Journal of Behavioral Health Services and Research, 41(3), 347-355. PMID:24026234.
employment. Psychiatr Rehabil J, 37(2), 99-106. PMID:24912058. Luciano, A., & Carpenter-Song, E. A. (2014). A qualitative study of career exploration among young adult men with psychosis and co-occurring substance use disorder. J Dual Diagn, 10(4), 220-225. PMID:25391280. Luciano, A., & Meara, E. (2014). Employment status of people with mental illness: national survey data from 2009 and 2010. Psychiatric Services, 65(10), 1201-1209. PMID:24933361. Michon, H., van Busschbach, J. T., Stant, A. D., van Vugt, M. D., van Weeghel, J., & Kroon, H. (2014). Effectiveness of individual placement and support for people with severe mental illness in the Netherlands: A 30-month randomized controlled trial. Psychiatr Rehabil J, 37(2), 129-136. PMID:24912062. Mueser, K. T., Bond, G. R., Essock, S. M., Clark, R. E., Carpenter-Song, E., Drake, R. E., & Wolfe, R. (2014). The effects of supported employment in Latino consumers with severe mental illness. Psychiatr Rehabil J, 37(2), 113-122. PMID:24912060. Mueser, K. T., & Cook, J. A. (2014). Rising to the challenge of first episode psychosis: The NIMH Recovery After Initial Schizophrenia Episode (RAISE) initiative. Psychiatr Rehabil J, 37(4), 267-269. PMID:25496198. Mueser, K. T., & McGurk, S. R. (2014). Supported employment for persons with serious mental illness: current status and future directions. Encephale, 40 (Suppl 2), S45-56. PMID:24929974. Nicholson, J. (2014). For parents with mental health conditions: The chance to “have it all” at work and at home. Psychiatr Rehabil J, 37(2), 153-156. PMID:24684181. Oshima, I., Sono, T., Bond, G. R., Nishio, M., & Ito, J. (2014). A randomized controlled trial of individual placement and support in Japan. Psychiatr Rehabil J, 37(2), 137-143. PMID:24912063. Ottomanelli, L., Barnett, S. D., & Toscano, R. (2014). Individual placement and support (IPS) in physical rehabilitation and medicine: The VA spinal cord injury experience. Psychiatr Rehabil J, 37(2), 110-112. PMID:24912059. Peterson, A. E., Bond, G. R., Drake, R. E., McHugo, G. J., Jones, A. M., & Williams, J. R. (2014). Predicting the long-term sustainability of evidence-based practices in mental health care: an 8-year longitudinal analysis. Journal of Behavioral Health Services and Research, 41(3), 337-346. PMID:23709327. Poremski, D., Whitley, R., & Latimer, E. (2014). Barriers to obtaining employment for people with severe mental illness experiencing homelessness. J Ment Health. PMID:24784467. Salkever, D. S., Gibbons, B., Drake, R. E., Frey, W. D., Hale, T. W., & Karakus, M. (2014). Increasing earnings of social security disability income beneficiaries with serious mental disorder. J Ment Health Policy Econ, 17(2), 75-90. Salkever, D. S., Gibbons, B., Frey, W. D., Milfort, R., Bollmer, J., Hale, T. W., Drake, R. E., & Goldman, H. H. (2014). Recruitment in the Mental Health Treatment Study: a behavioral health/employment intervention for Social Security disabled-worker beneficiaries.”. Social Security Bulletin, 74(2), 27-46. Strickler, D. C. (2014). Rebirth through supported employment. Psychiatr Rehabil J, 37(2), 151-152. PMID:24912064. Swanson, S. J., Courtney, C. T., Meyer, R. H., & Reeder, S. A. (2014). Strategies for integrated employment and mental health services. Psychiatr Rehabil J, 37(2), 86-89. PMID:24708194. Taylor, A. C., & Bond, G. R. (2014). Employment specialist competencies as predictors of employment outcomes. Community Mental Health Journal, 50(1), 31-40. PMID:23054156. Bond, G. R. (2013). Supported employment for justice-involved people with mental illness SAMHSA’S GAINS Center for Behavioral Health and Justice Transformation (pp. 1-4). Delmar, NY: SAMHSA. Bond, G. R., Campbell, K., & Becker, D. R. (2013). A test of the occupational matching hypothesis for rehabilitation clients with severe mental illness. Journal of Occupational Rehabilitation, 23, 261-269. Bond, G. R., & Drake, R. E. (2013). Making the case for IPS supported employment. Administration and Policy in Mental Health and Mental Health Services. Drake, R. E., Xie, H., Bond, G. R., McHugo, G. J., & Caton, C. L. (2013). Early psychosis and employment. Schizophrenia Research, 146, 111-117. Glover, C. M., & Frounfelker, R. L. (2013). Competencies of more and less successful employment specialists. Community Mental Health Journal, 49, 311-316. Becker, D. R., Drake, R. E., Kopelowicz, A., Tovey, W. & Liberman, R. P.
(2013). A demonstration project involving peers as providers of evidence-based, supported employment services. Psychiatric Rehabilitation Journal, 36, 99-107. Knapp, M., Patel, A., Curran, C., Latimer, E., Catty, J., Becker, T. Burns, T. (2013). Supported employment: cost-effectiveness across six European sites. World Psychiatry, 12, 60-68. Kukla, M., & Bond, G. R. (2013). A randomized controlled trial of evidence-based supported employment: nonvocational outcomes. Journal of Vocational Rehabilitation, 38, 91-98. Kukla, M., & Bond, G. R. (2013). Supported employment. In V. Vandiver (Ed. ), A pocket guide: best practices in community mental health (pp. 151-165). Chicago: Lyceum Books. Oulvey, G., Carpenter-Song, E., & Swanson, S. J. (2013). Principles for enhancing the role of vocational rehabilitation in IPS supported employment. Psychiatric Rehabilitation Journal, 36, 4-6. Swanson, S. J., & Becker, D. R. (2013). 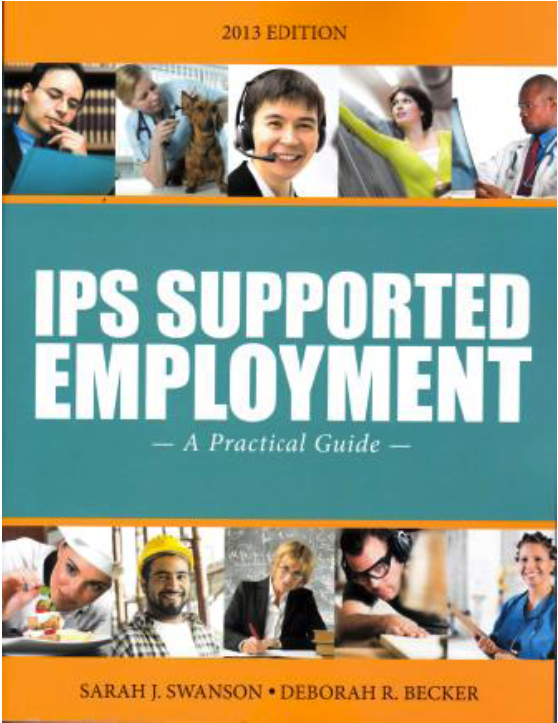 IPS supported employment: a practical guide. Lebanon, NH: Dartmouth Psychiatric Research Center. Swanson, S. J., Becker, D. R., & Bond, G. R. (2013). Job development guidelines in supported employment. Psychiatric Rehabilitation Journal, 36, 122-123. Swarbrick, M., & Drake, R. E. (2013). Supported housing, socialization, education and employment Modern Community Mental Health: an interdisciplinary approach (pp. 376-384): Oxford University Press. Bond, G.R.,and Drake, R.E. Making the case for IPS supported employment. Administration and Policy in Mental Health and Mental Health Services Research. In press. Bond, G.R., Campbell, K., & Drake, R.E. Standardizing measures in four domains of employment outcome for Individual Placement and Support. Psychiatric Services, DOI: 10.1176/appi.ps.201100270, 2012. Bond, G. R., & Drake, R. E. (2012). Making the case for IPS supported employment. Administration and Policy in Mental Health and Mental Health Services Research, DOI 10.1007/s10488-012-0444-6. Bond, G.R. & Drake, R.E. Making the case for IPS supported employment. Administration and Policy in Mental Health and Mental Health Services Research, DOI 10.1007/s10488-012-0444-6, 2012. Bond, G.R., Drake, R.E. & Becker, D.R. Generalizability of the individual placement and support (IPS) model of supported employment outside the US. World Psychiatry, 11 (1), 32-39, 2012. 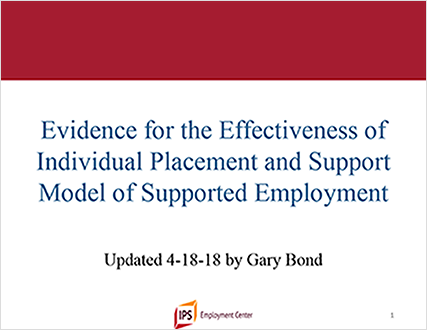 Bond, G.R., Drake, R.E., & Campbell, K. The Effectiveness of the individual placement and support model of supported employment for young adults: results from four randomized controlled trials. 8th International Conference on Early Psychosis. Early Intervention in Psychiatry, 6 (Suppl. 1), 30, 2012. Bond, G. R., Peterson, A. E., Becker, D. R., & Drake, R. E. (2012). Validation of the revised Individual Placement and Support Fidelity Scale (IPS-25). Psychiatric Services, in Advance, June 1, 2012; DOI: 10.1176/appi.ps.201100476. Bond, G. R., Peterson, A. E., Drake, R. E., McHugo, G. J., Jones, A. M., & Williams, J. (2012). Long- term sustainability of evidence-based practices in community mental health agencies. Administration and Policy in Mental Health and Mental Health Services Research, 39, 10.1007/s10488-10012- 10461-10485. Bond, G.R., Drake, R.E., McHugo, G.J., Peterson, A.E., Jones, A.M., Williams, J., Hennessy, K. Long-term sustainability of evidence-based practices in community mental health. Administration and Policy in Mental Health and Mental Health Services Research. In press. Bond, G.R., and Drake, R.E. Making the case for IPS supported employment. Administration and Policy in Mental Health and Mental Health Services Research. In press. Davis, L.L., Leon, A.C., Toscano, R., Drebbing, C.E., Ward, L.C., Parker, P.E., et al. A randomized controlled trial of supported employment among veterans with post- traumatic stress disorder. Psychiatric Services, DOI: 10.1176/appi.ps.201100340, 2012. Drake, R.E., Bond, G.R., & Becker, D.R. Individual Placement and Support: An Evidence-Based Approach to Supported Employment. New York: Oxford University Press, 2012. Drake, R.E., Bond, G.R., Thornicroft, G., Knapp, M., & Goldman, H.H. Mental health disability: An international perspective. Journal of Disability Policy Studies, 23, 110-120, 2012. Knapp, M., Patel, A., Curran, C., Latimer, E., Catty, J., Becker, T., Drake, R.E., Fioritti, A., Kilian, R., Lauber, C., Rossler, W.,Tomov, T., van Busschbach, J., Comas-Herrera, A., White, S., Wiersma, D., Burns, T. Supported employment:cost-effectiveness across six European sites. World Psychiatry, in press. Kukla, M. & Bond, G.R. Job match and job tenure in persons with severe mental illness. Journal of Rehabilitation, 78(1), 11-15, 2012. Kukla, M., Bond, G.R., & Xie, H. A prospective investigation of work and convocational outcomes in adults with severe mental illness. Journal of Nervous and Mental Disease, 200, 214-222, 2012. Kukla, M., & Bond, G. R. (in press). A randomized controlled trial of evidence-based supported employment: nonvocational outcomes. Journal of Vocational Rehabilitation. McHugo, G. J., Drake, R. E., Xie, H., & Bond, G. R. (2012). A 10-year study of steady employment and non-vocational outcomes among people with serious mental illness and co-occurring substance use disorder. Schizophrenia Research, 138, 233-239. Monroe-DeVita, M., Morse, G. A., & Bond, G. R. (2012). Program fidelity and beyond: Multiple strategies and criteria for ensuring quality in ACT. Psychiatric Services, 63, 743-750. Mueser, K.T., & Bond, G.R. Supported Employment. In H.L. McQuistion et al., (eds.) Handbook of Community Psychiatry. New York: Springer, 309-318, 2012. Swanson, S. J., Langfitt-Reese, S., & Bond, G. R. (2012). Employer attitudes about criminal justice history. Psychiatric Rehabilitation Journal, 35, 385-390. Taylor, A. C., & Bond, G. R. (2012). Employment specialist competencies as predictors of employment outcomes. Community Mental Health Journal, DOI: 10.1007/s10597-012-9554-6. Torrey, W. C., Bond, G. R., McHugo, G. J., & Swain, K. (2012). Evidence-based practice implementation in community mental health settings: The relative importance of key domains of implementation activity. Administration and Policy in Mental Health and Mental Health Services Research, 39, 353-364. Twamley, E.W., Vella, L., Burton, C.Z., Becker, D.R., Bell, M.D., & Jeste, D.V. The efficacy of supported employment for middle-aged and older people with schizophrenia. Schizophrenia Research, 135,100-104, 2012. Wykes, T., and Drake, R.E. Rehabilitative therapies. In J.A. Lieberman and R.M. Murray (Eds. ), Comprehensive Care of Schizophrenia. New York, NY: Oxford University Press, 182-198, 2012. Becker, D.R., Bond, G.R. & Drake, R.E. Individual placement and support: the evidence-based practice of supported employment. Oxford Textbook of Community Mental Health. New Oxford Press, 161-166, 2011. Becker, D.R., Drake, R.E., & Bond, G.R. Benchmark outcomes in supported employment. American Journal of Psychiatric Rehabilitation, 14, 230-236, 2011. Becker, D.R., Drake, R.E., Bond, G.R., Nawaz, S., Haslett, W., & Martinez, R.A. A national mental health learning collaborative on supported employment. Psychiatric Services 62, 7: 704-706, 2011. Becker, D.R., Swanson, S., Bond, G.R., & Merrens, M.R. Evidence-based supported employment fidelity review manual (2nd. Ed.). Lebanon, NH: Dartmouth Psychiatric Research Center, 2011. Bond, G.R., Becker, D.R., & Drake, R.E. Measurement of fidelity of implementation of evidence-based practices: Case example of the IPS Fidelity Scale. Clinical Psychology: Science and Practice, 18, 126-141, 2011. Bond, G. R., Drake, R. E., & Becker, D. R. Implementation of IPS supported employment around the world: Planned vs. unplanned dissemination. A commentary on Mennear et al. Social Science and Medicine, 72, 1036-1038, 2011. Bond, G. R., & Kukla, Marina. Impact of follow-along support on job tenure in the individual placement and support model. The Journal of Nervous and Mental Disease, 199, 3: 150-155, 2011. Bond, G. R., & Kukla, M. Is job tenure brief in individual placement and support (IPS) employment programs? Psychiatric Services, 62, 950-953, 2011. Campbell, K., Bond, G. R., & Drake, R. E. Who benefits from supported employment: A meta-analytic study. 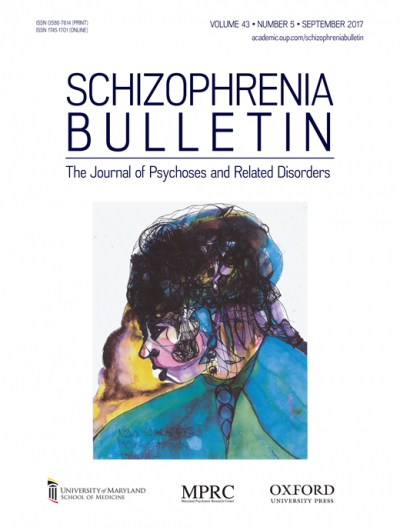 Schizophrenia Bulletin, 37, 370-380, 2011. Corbiere, M., Zaniboni, S., Bond, G.R., Giles, P., Lesage, A., & Goldner, E. Job acquisition for people with severe mental illness enrolled in supported employment programs: A theoretically grounded empirical study. Journal of Occupational Rehabilitation, 21, 342-354 2011. Drake, R.E. & Becker, D.R. Why not implement supported employment? Psychiatric Services, 62, 11: 1251, 2011. Drake, R.E. & Bond, G.R. (Guest Editors) Special issue on IPS support employment. American Journal of Psychiatric Rehabilitation, 14 (3), 2011. Drake, R.E. & Bond, G.R. IPS supported employment: A 20-year update. American Journal of Psychiatric Rehabilitation, 14 (3), 155-164, 2011. Drake, R.E., Bond, G.R., Thornicroft, G., Knapp, M., & Goldman, H.H. Mental health disability: An international perspective. Journal of Disability Policy Studies, DOI: 10.1177/1044207311427403, 2011. Frey, W.D., Drake, R.E., Bond, G.R., Miller, A.L., Goldman, H.H., Salkever.D.S., et al. Mental HealthTreatment Study: Final Report to Social Security Administration (https://socialsecurity.gov/disabilityresearch/mentalhealth.htm) Rockville, MD: Westat, 2011. Frounfelker, R.L., Teachout, A., Bond, G.R., Drake, R.E. Criminal justice involvement of individuals with severe mental illness and supported employment outcomes. Community Mental Health Journal, 47, 737-741, 2011. Frounfelker, R.L., Wilkniss, S.M., Bond, G.R., Devitt, T.S., & Drake, R.E. Enrollment in supported employment services for clients with a co-occurring disorder. Psychiatric Services, 62, 5: 545-547, 2011. McGuire, A.B., Bond, G.R., Clendenning, D.R., & Kukla, M. Service intensity as a predictor of competitive employment in an individual placement and support model. Psychiatric Services, 62(9), 1066-1072, 2011. Mueser, K.T., Campbell, K. & Drake, R.E. The effectiveness of supported employment in people with Dual Disorders. Journal of Dual Diagnosis, 7:1, 90-102, 2011. Rollins, A.L., Bond, G.R., Jones, A.M., Kukla, M., & Collins, L.A. Workplace social networks and their relationship with job outcomes and other employment characteristics for people with severe mental illness. Journal of Vocational Rehabilitation, 35, 243-252, 2011. Swanson, S.J., & Becker, D.R. (2011) Supported employment: Applying the individual placement and support (IPS) model to help clients compete in the workforce. Center City, MN: Hazelden. Bond, G. R., Drake, R. E., & Becker, D. R. Beyond evidence-based practice: Nine ideal features of a mental health intervention. Research on Social Work Practice, 20 (5), 493-501, 2010. Campbell, K., Bond, G. R., Drake, R. E., McHugo, G. J., & Xie, H. Client predictors of employment outcomesin high-fidelity supported employment: A regression analysis. Journal of Nervous and Mental Disease, 198, 556-563, 2010. Dreher, K. C., Bond, G. R., & Becker, D. R. The creation of the IPS-Q: A measure to assess knowledge of the Individual Placement and Support model. Psychiatric Rehabilitation Journal, 33, 181-189, 2010. Frounfelker, R., Glover, C., Teachout, A., Wilkniss, S., & Whitley, R. Access to supported employment for consumers with criminal justice involvement. Psychiatric Rehabilitation Journal, 34, 49-56, 2010. Glover, C.M., Corrigan, P., Wilkniss, S. The effects of multiple categorization on perceptions of discrimination, life domains, and stress for individuals with severe mental illness. Journal of Vocational Rehabilitation, 33, 113-121, 2010. Kostick, K.M., Whitley, R., Bush, P.W. Client-centeredness in supported employment: Specialist and supervisor perspectives. Journal of Mental Health, 1-9, First article. Siu, P. S., Tsang, H. W., & Bond, G. R. Non-vocational outcomes for clients with severe mental illness obtaining employment in Hong Kong. Journal of Vocational Rehabilitation, 32, 15-24, 2010. Bush, P.W., Drake, R.E., Xie, H., McHugo, G.J., & Haslett, W.R. The long-term impact of employment on mental health service use and costs for persons with severe mental illness. Psychiatric Services, 60, 1024-1031, 2009. Campbell, K., Bond, G.R., & Drake, R.E. Who benefits from supported employment: A meta-analytic study. Schizophrenia Bulletin, DOI: 10.1093/schbul/sbp066, 2009. Drake, R.E., & Bond, G.R. Reply to the letter to the editor. Psychiatric Rehabilitation Journal, 32, 259- 260, 2009. Drake, R.E., Skinner, J.S., Bond, G.R., & Goldman, H.H. Social Security and mental illness: Reducing disability with supported employment. Health Affairs, 28, 761-770, 2009. Kern, R.S., Liberman, R.P., Becker, D.R., Drake, R.E., Sugar, C.A., & Green, M.F. Errorless learning for training individuals with schizophrenia at a community mental health setting providing work experience. Schizophrenia Bulletin, 35, 807-815, 2009. Kukla, M., & Bond, G.R. The working alliance and employment outcomes for people with severe mental illness enrolled in vocational programs. Rehabilitation Psychology, 54, 157-163, 2009. Kukla, M., & Bond, G. R. Supported employment. In A. R. Roberts (Ed.) Social Workers’ Desk Reference (2nd ed., pp. 704-710). New York: Oxford University Press, 2009. McGurk, S.R., Mueser, K.T., DeRosa, T.J., & Wolfe, R. Work, recovery and comorbidity in schizophrenia: A randomized controlled trial of cognitive remediation. Schizophrenia Bulletin, 35, 319-335, 2009. Strickler, D.C., Whitley, R.E., Becker, D.R., & Drake, R.E. First person accounts of long-termemployment activity among people with dual diagnosis. Psychiatric Rehabilitation Journal, 32, 261-268, 2009. Whitley, R., Kostick, K., & Bush, P.W. Supported employment specialist strategies to assist clients with severe mental illness and criminal justice issues. Psychiatric Services, 60, 1637-1641, 2009. Becker, D.R. Vocational rehabilitation. In K. T. Mueser & D. V. Jeste (Eds.). Clinical Handbook of Schizophrenia (pp. 261-267). New York: The Guilford Press, 2008. Becker, D.R., Lynde, D., & Swanson, S. Strategies for state-wide implementation of supportedemployment: The Johnson & Johnson-Dartmouth Community Mental Health Program. Psychiatric Rehabilitation Journal, 31, 296-299, 2008. Becker, D.R., Swanson, S., Bond, G.R., & Merrens, M.R. 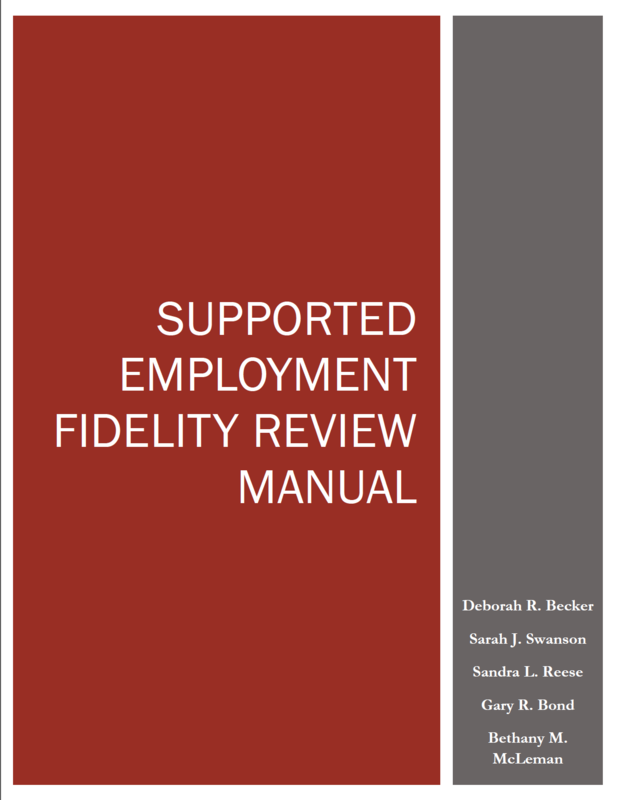 Evidence-Based Supported Employment Fidelity Review Manual. San Diego: University Readers, 2008. Bond, G.R., & Drake, R.E. Predictors of competitive employment among patients with schizophrenia. Current Opinion in Psychiatry, 21, 362-369, 2008. Bond, G.R., Drake, R.E., & Becker, D.R. An update on randomized controlled trials of evidence-based supported employment. Psychiatric Rehabilitation Journal, 31, 280-289, 2008. Bond, G.R., McHugo, G.J., Becker, D.R., Rapp, C.A., & Whitley, R. Fidelity of supported employment: Lessons learned from the National Evidence-Based Practice Project. Psychiatric Rehabilitation Journal, 31, 300-305, 2008. Catty, J., Lissouba, P., White, S., Becker, T., Drake, R.E., Fioritti, A., Knapp, M., Lauber, C., Rössler, W., Tomov, T., van Busschbach, J., Wiersma, D., Burns, T., & The EQOLISE Group. Predictors ofemployment for people with severe mental illness: Results of an international six-centre randomized controlled trial. British Journal of Psychiatry, 192, 224-231, 2008.
et al. Effectiveness of supported employment for individuals with schizophrenia: Results of a multi-site, randomized trial. Clinical Schizophrenia & Related Psychoses, 2, 37-46, 2008. Cook, J.A., Blyler, C.R., Leff, H.S., McFarlane, W.R., Goldberg, R.W., Gold, P.B., Mueser, K.T., Shafer, M.S., Onken, S.J., Donegan, K., Carey, M.A., Kaufmann, C., & Razzano, L.A. The employment intervention demonstration program: Major findings and policy implications. Psychiatric Rehabilitation Journal, 31, 291-295, 2008. Drake, R.E., & Bond, G.R. The future of supported employment for people with severe mental illness. Psychiatric Rehabilitation Journal, 31, 367-376, 2008. Drake, R.E., & Bond, G.R. Supported employment: 1998 to 2008. Psychiatric Rehabilitation Journal, 31, 274-275, 2008. Drake, R.E. The mental health treatment study. Psychiatric Rehabilitation Journal, 31, 306-311, 2008. Lindenmayer, J.P., McGurk, S.R., Mueser, K.T., Khan, A., Wance, D., Hoffman, L., Wolfe, R., & Xie, H.
A randomized controlled trial of cognitive remediation among inpatients with persistent mental illness. Psychiatric Services, 59, 241-247, 2008. Marshall, T., Rapp, C.A., Becker, D.R., & Bond, G.R. Key factors for implementing supported employment. Psychiatric Services, 59, 886-892, 2008. McGurk, S.R., & Wykes, T. Cognitive remediation and vocational rehabilitation. Psychiatric Rehabilitation Journal, 31, 350-359, 2008. Nuechterlein, K.H., Subotnik, K.L., Turner, L.R., Ventura, J., Becker, D.R., & Drake, R.E. Individual placement and support for individuals with recent-onset schizophrenia: Integrating supported education and supported employment. Psychiatric Rehabilitation Journal, 31, 340-349, 2008. Swanson, S.J., Becker, D.R., Drake, R.E., & Merrens, M.R. Supported Employment: A Practical Guide for Practitioners and Supervisors. Lebanon, NH: Dartmouth Psychiatric Research Center, 2008. Twamley, E.W., Narvaez, J.M., Becker, D.R., Bartels, S.J., & Jeste, D.V. Supported employment for middle-aged and older people with schizophrenia. American Journal of Psychiatric Rehabilitation, 11, 76-89, 2008. Becker, D.R., Baker, S.R., Carlson, L., Flint, L., Howell, R., Lindsay, S., Moore, M., Reeder, S., & Drake, R.E. Critical strategies for implementing supported employment. Journal of Vocational Rehabilitation, 27, 13-20, 2007. Becker, D.R., Whitley, R., Bailey, E.L., & Drake, R.E. Long-term employment trajectories among participants with severe mental illness in supported employment. Psychiatric Services, 58, 922- 928, 2007. Bond, G.R. International perspectives on simple supported employment for people with severe mental illness [Editorial]. Journal of Vocational Rehabilitation, 27, 1-2, 2007. Bond, G.R. Modest Implementation efforts, modest fidelity, and modest outcomes [Commentary]. Psychiatric Services, 58, 334, 2007.
randomized controlled trial comparing two vocational models for persons with severe mental illness. Journal of Consulting and Clinical Psychology, 75, 968-982, 2007. Bond, G.R., Xie, H., & Drake, R.E. Can SSDI and SSI beneficiaries with mental illness benefit from evidence-based supported employment? Psychiatric Services, 58, 1412-1420, 2007. Busschbach, J.V., White, S., Wiersma, D., & EQOLSE Group. The effectiveness of supported employment for people with severe mental illness: A randomized controlled trial. The Lancet, 370, 1146-1152, 2007. Coldberg, R.W., Sshafer, M.S., Onken, S.J., McFarlane, W.R., Donegan, K., Carey, M.A., Kaufmann, C., et al. Effects of co-occurring disorders on employment outcomes in a multisite randomized study of supported employment for people with severe mental illness. Journal of Rehabilitation Research & Development, 44, 837-849, 2007. DeRosa, T., McGurk, S.R., Mueser, K.T., Morin, I., & Wiesen, T. Clients’ perceptions of effective supports in vocational rehabilitation. Clinical Schizophrenia & Related Psychoses, 1, 154-160, 2007. McGurk, S.R., Mueser, K.T., Feldman, K., Wolfe, R., & Pascaris, A. Cognitive training for supported employment: 2-3 year outcomes of a randomized controlled trial. American Journal of Psychiatry, 164, 437-441, 2007. Alverson, H.S., Carpenter, E., & Drake, R.E. An ethnographic study of job seeking among people with severe mental illness. Psychiatric Rehabilitation Journal, 30, 15-22, 2006. Becker, D.R., & Drake, R.E. Does a supported employment intervention improve outcomes for people with severe mental illness? Evidence-Based Mental Health, 9, 22, 2006. Becker, D.R., Xie, H., McHugo, G.J., Halliday, J., & Martinez, R.A. What predicts supported employment program outcomes? Community Mental Health Journal, 42, 303-318, 2006. Drake, R.E., Becker, D.R., Goldman, H.H., & Martinez, R.A. The Johnson & Johnson-Dartmouth community mental health program: Disseminating evidence-based practice. Psychiatric Services, 42, 315-318, 2006. Drake, R.E., Bond, G.R., & Rapp, C. Explaining the variance within supported employment programs: Comment on “What predicts supported employment outcomes?” Community Mental Health Journal, 42, 315-318, 2006. Goldman, H.H., & Drake, R.E. Mood disorders and workplace performance: Half a loaf. American Journal of Psychiatry, 163, 1490-1491, 2006. Latimer, E.A., Lecomte, T., Becker, D.R., Drake, R.E., Duclos, I., Piat, M., Lahaie, N., St. Pierre, M., Therrien, C., & Xie, H. Generalizability of the Individual Placement and Support model of supported employment: Results of a Canadian randomized controlled trial. British Journal of Psychiatry, 189, 65-73, 2006. McGurk, S.R., & Mueser, K.T. Cognitive and clinical predictors of work outcomes in clients with schizophrenia receiving supported employment services: 4-year follow-up. Administration Policy Mental Health & Mental Health Services Research, 33, 598-606, 2006. McGurk, S.R., & Mueser, K.T. Strategies for coping with cognitive impairments of clients in supported employment. Psychiatric Services, 57, 1421-1429, 2006. Mueser, K.T., Glynn, S.M., & McGurk, S.R. Social and vocational impairments. In J. A. Lieberman, T. S. Stroup & D. O. Perkins (Eds.). Textbook of Schizophrenia (pp. 275-288). Washington, DC: American Psychiatric Publishing, Inc., 2006. Tremblay, T., Smith, J., Xie, H., & Drake, R.E. Effect of benefits counseling services on employment outcomes for people with psychiatric disabilities. Psychiatric Services, 57, 816-821, 2006. Becker, D.R., & Drake, R.E. L’inserimento lavorativo dei pazienti con gravi disturbi mentali [Training to work in patients with severe mental illness]. Psichiatria Di Comunita, 4, 193-199, 2005. Becker, D.R., Drake, R.E., & Naughton, W. Supported employment for people with co-occurring disorders. Psychiatric Rehabilitation Journal, 28, 332-338, 2005. Cook, J.A., Leff, H.S., Blyler, C.R., Gold, P.B., Goldbeerg, R.W., Mueser, K.T., Toprac, M.G., McFarlane, W.R., Shafer, M.S., Blankertz, L.E., Dudek, K., Razzano, L.A., et al. Results of a multisite randomized trial of supported employment interventions for individuals with severe mental illness. Archives of General Psychiatry, 62, 505-512, 2005. Cook, J.A., Lehman, A.F., Drake, R., McFarlane, W.R., Gold, P.B., Leff, H.S., Blyler, C., Toprac, M.G., Razzano, L.A., Burke, J., Blankertz, L., Shafer, M., et al. Integration of psychiatric and vocational services: A multi-site randomized implementation effectiveness trial of supported employment. American Journal of Psychiatry, 162, 1948-1956, 2005. Drake, R.E. Foreword. In B. Grove, J. Secker & P. Seebohm (Eds.). New Thinking about Mental Health and Employment (pp. v-vi). Oxford: Radcliffe Publishing, 2005. Drake, R.E., Teague, G.B., & Gersing, K. State mental health authorities and informatics. Community Mental Health Journal, 41, 365-370, 2005. McGurk, S.R., Mueser, K.T., & Pascaris, A. Cognitive training and supported employment for persons with severe mental illness: One-year results from a randomized controlled trial. Schizophrenia Bulletin, 31, 898-909, 2005. Mueser, K.T., Aalto, S., Becker, D.R., Ogden, J., Wolfe, R., Schiavo, D., Wallace, C.J., & Xie, H. The effectiveness of skills training in improving outcomes in supported employment. Psychiatric Services, 56, 1254-1260, 2005. Liberman, R.P., Drake, R.E., & Mintz, J. Advances in improving and predicting work outcome in recent-onset schizophrenia. Schizophrenia Bulletin, 31, 530, 2005. Rapp, C.A., Bond, G.R., Becker, D.R., Carpinello, S.E., Nikkel, R.E., & Gintoli, G. The role of state mental health authorities in promoting improved client outcomes through evidence-based practice. Community Mental Health Journal, 47, 347-363, 2005. Razzano, L.A., Cook, J.A., Burke-Miller, J., Mueser, K.T., & Pickett-Schenk, S.A. Clinical factors associated with employment among people with severe mental illness. The Journal of Nervous and Mental Disease, 193, 705-713, 2005. Torrey, W.C. Current developments in psychiatric rehabilitation for adults with severe mental illnesses. Directions in Psychiatry, 25, 101-107, 2005. Psychiatrique Manuel. [Handbook on Psychiatric Rehabilitation.] (pp. 165-193). Québec: Presses de l’Université du Québec, 2004. Becker, D.R., & Drake, R.E. Supported Employment for People with Severe Mental Illness: Fayette Companies, Peoria, Il, Chestnut Health Systems, Bloomington, Il, the University of Chicago Center for Psychiatric Rehabilitation, 2004. Bond, G.R., Kim, H.W., Meyer, P., Gibson, P.J., Tunis, S., Evans, J.D., Lysaker, P.H., McCoy, M.L., Dincin, J., & Xie, H. Response to vocational rehabilitation during treatment with first- or second- generation antipsychotics. Psychiatric Services, 55, 59-66, 2004. Latimer, E.A., Bush, P.W., Becker, D.R., Drake, R.E., & Bond, G.R. The cost of high-fidelity supported employment programs for people with severe mental illness. Psychiatric Services, 55, 401-406, 2004. McGurk, S.R., & Mueser, K.T. Cognitive functioning, symptoms, and work in supported employment: A review and heuristic model. Schizophrenia Research, 70, 147-173, 2004. Mueser, K.T., Clark, R.E., Haines, M., Drake, R.E., McHugo, G.J., Bond, G.R., Essock, S.M., Becker, D.R., Wolfe, R., & Swain, K. The Hartford study of supported employment for persons with severe mental illness. Journal of Consulting and Clinical Psychology, 72, 479-490, 2004. Mueser, K.T., & McGurk, S.R. Schizophrenia. In J. D. Thomas & M. Hersen (Eds.). Psychopathology at the Workplace: Recognition and Adaptation (pp. 161-186). New York: Brunner-Routledge, 2004. Salyers, M.P., Becker, D.R., Drake, R.E., Torrey, W.C., & Wyzik, P.F. 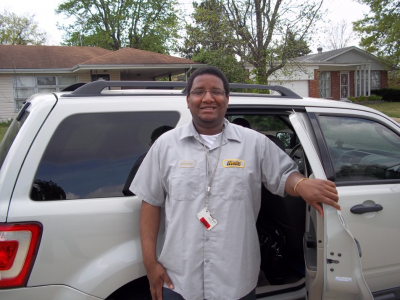 Ten-year follow-up of a supported employment program. Psychiatric Services, 55, 302-308, 2004. Tremblay, T., Xie, H., Smith, J., & Drake, R.E. The impact of specialized benefits counseling services on social security administration disability beneficiaries in Vermont. Journal of Rehabilitation, 70, 5-11, 2004. Becker, D.R., & Drake, R.E. A Working Life for People with Severe Mental Illness. New York: Oxford University Press, 2003. Cather, C., Mueser, K.T., & Goff, D.C. Psychosis: Peculiar behaviors and inflexible bizarre beliefs. In J. P. Kahn & A. M. Langlieb (Eds.). Mental Health and Productivity in the Workplace: A Handbook for Organizations and Clinicians (pp. 517-539). San Francisco: Jossey Bass, 2003. Drake, R.E., Becker, D.R., & Bond, G.R. Recent research on vocational rehabilitation for persons with severe mental illness. Current Opinion in Psychiatry, 16, 451-455, 2003. Drake, R.E., Becker, D.R., Bond, G.R., & Mueser, K.T. A process analysis of integrated and non-integrated approaches to supported employment. Journal of Vocational Rehabilitation, 18, 51-58, 2003. Williams, O.H., Toscano, R., & Stormer, G. The program of assertive community treatment: Implementation and dissemination of an evidence-based model of community-based care for persons with severe and persistent mental illness. Cognitive and Behavioral Practice, 10, 290- 303, 2003. McGurk, S.R., & Mueser, K.T. Cognitive functioning and employment in severe mental illness. The Journal of Nervous and Mental Disease, 191, 789-798, 2003. McGurk, S.R., Mueser, K.T., Harvey, P.D., LaPuglia, R., & Marder, J. Cognitive and symptom predictors of work outcomes for clients with schizophrenia in supported employment. Psychiatric Services, 54, 1129-1135, 2003. Dixon, L., Hoch, J., Clark, R.E., Bebout, R.R., Drake, R.E., McHugo, G.J., & Becker, D.R. Cost- effectiveness of two vocational rehabilitation programs for persons with severe mental illness. Psychiatric Services, 53, 1118-1124, 2002.
schizophrenia. In H. Kashima, I. R. H. Falloon, M. Mizuno & M. Asai (Eds.). Comprehensive Treatment of Schizophrenia: Linking Neurobehavioral Findings to Psychosocial Approaches (pp. 344-351). Tokyo: Springer-Verlag, 2002. Mueser, K.T., & Becker, D.R. Schizophrenia. In J. C. Thomas & M. Hersen (Eds.). Handbook of Mental Health in the Workplace (pp. 249-268). Thousand Oaks, CA: Sage Publications, 2002. Provencher, H.L., Gregg, R., Mead, S., & Mueser, K.T. The role of work in the recovery of persons with psychiatric disabilities. Journal of Psychiatric Rehabilitation, 26, 132-144, 2002. Rollins, A.L., Mueser, K.T., Bond, G.R., & Becker, D.R. Social relationships at work: A comparison of two vocational models for people with SMI. Psychiatric Rehabilitation Journal, 26, 51-61, 2002. Becker, D.R. Implementing supported employment as an evidence-based practice. In D. R. Becker & M. Barcus (Eds.). Connections – State Partnership Initiative (Vol. Spring/Summer, pp. 2-3). Fairfax, VA: Virginia Commonwealth University, 2001. Becker, D.R., Bond, G.R., McCarthy, D., Thompson, D., Xie, H., McHugo, G.J., & Drake, R.E. Converting day treatment centers to supported employment programs in Rhode Island. Psychiatric Services, 52, 351-357, 2001. Becker, D.R., & Drake, R.E. Improving employment outcomes for people with severe psychiatric disabilities. In B. Dickey & L. Sederer (Eds.). Improving Mental Health Care: Commitment to Quality (pp. 235-240). Washington, DC: American Psychiatric Press, Inc., 2001. Becker, D.R., Smith, J., Tanzman, B., Drake, R.E., & Tremblay, T. Fidelity of supported employment programs and employment outcomes. Psychiatric Services, 52, 834-836, 2001. Bond, G.R., Becker, D.R., Drake, R.E., Rapp, C.A., Meisler, N., Lehman, A.F., & Bell, M.D. Implementing supported employment as an evidence-based practice. Psychiatric Services, 52, 313-322, 2001. Bond, G.R., Resnick, S.G., Drake, R.E., Xie, H., McHugo, G.J., & Bebout, R.R. Does competitive employment improve nonvocational outcomes for people with severe mental illness? Journal of Consulting and Clinical Psychology, 69, 489-501, 2001. Bond, G.R., Vogler, K.M., Resnick, S.G., Evans, L.A., Drake, R.E., & Becker, D.R. Dimensions of supported employment: Factor structure of the IPS Fidelity Scale. Journal of Mental Health, 10, 383-393, 2001. Caswell, J.S. Employment: A consumer’s perspective. In D. R. Becker & M. Barcus (Eds.). Connections – State Partnership Initiative (Vol. Spring/Summer, pp. 5). Fairfax, VA: Virginia Commonwealth University, 2001. Mueser, K.T., Becker, D.R., & Wolfe, R. Supported employment, job preferences, and job tenure and satisfaction. Journal of Mental Health, 10, 411-417, 2001. Mueser, K.T., Salyers, M.P., & Mueser, P.R. A prospective analysis of work in schizophrenia. Schizophrenia Bulletin, 27, 281-296, 2001. Quimby, E., Drake, R.E., & Becker, D.R. Ethnographic findings from the Washington, DC Vocational Services Study. Psychiatric Rehabilitation Journal, 24, 368-374, 2001. Salyers, M.P., McHugo, G.J., Cook, J.A., Razzano, L.A., Drake, R.E., & Mueser, K.T. Reliability of instruments in a cooperative, multisite study: Employment intervention demonstration program. Mental Health Services Research, 3, 129-139, 2001. Torrey, W.C., Drake, R.E., Dixon, L., Burns, B.J., Rush, A.J., Clark, R.E., & Klatzker, D. Implementing evidence-based practices for persons with severe mental illnesses. Psychiatric Services, 52, 45-50, 2001. Drake, R.E. Introduction to a special series on recovery. Community Mental Health Journal, 36, 207- 208, 2000. Mueser, K.T., Bond, G.R., & Drake, R.E. Una resena del tratamiento psicosocial de los trastornos mentales severos. Vertex, 2, 31-47, 2000. Noordsy, D.L., Torrey, W.C., Mead, S., Brunette, M., Potenza, D., & Copeland, M.E. Recovery-oriented psychopharmacology: Redefining the goals of antipsychotic treatment. Journal of Clinical Psychiatry, 61, 22-29, 2000. Torrey, W.C., Mueser, K.T., McHugo, G.J., & Drake, R.E. Self-esteem as an outcome measure in studies of vocational rehabilitation for adults with severe mental illness. Psychiatric Services, 51, 229-233, 2000. Torrey, W.C., & Wyzik, P. The recovery vision as a service improvement guide for community mental health center providers. Community Mental Health Journal, 36, 209-216, 2000. Bond, G.R., Drake, R.E., Becker, D.R., & Mueser, K.T. Effectiveness of psychiatric rehabilitation approaches for employment of people with severe mental illness. Journal of Disability Studies, 10, 18-52, 1999. Catalano, R., Drake, R.E., Becker, D.R., & Clark, R.E. Labor market conditions and employment of the mentally ill. The Journal of Mental Health Policy and Economics, 2, 51-54, 1999. Drake, R.E., Becker, D.R., Clark, R.E., & Mueser, K.T. Research on the Individual Placement and Support model of Supported Employment. Psychiatric Quarterly, 70, 289-301, 1999. Drake, R.E., McHugo, G.J., Bebout, R.R., Becker, D.R., Harris, M., Bond, G.R., & Quimby, E. A randomized clinical trial of supported employment for inner-city patients with severe mental illness. Archives of General Psychiatry, 56, 627-633, 1999. Alverson, H., & Vincente, E. An ethnographic study of vocational rehabilitation for Puerto Rican Americans with severe mental illness. Psychiatric Rehabilitation Journal, 22, 69-72, 1998. Alverson, H., Alverson, M., Drake, R.E., & Becker, D.R. Social correlates of competitive employment among people with severe mental illness. Psychiatric Rehabilitation Journal, 22, 34-40, 1998. Bailey, E.L., Ricketts, S.K., Becker, D.R., Xie, H., & Drake, R.E. Do long-term day treatment clients benefit from supported employment? Psychiatric Rehabilitation Journal, 22, 24-29, 1998. Bailey, J. I’m just an ordinary person. Psychiatric Rehabilitation Journal, 22, 8-10, 1998. Bebout, R.R., Becker, D.R., & Drake, R.E. A research induction group approach for clients entering a mental health research project. A replication study. Community Mental Health Journal, 34, 289-295, 1998. Becker, D.R., Bebout, R.R., & Drake, R.E. Job preferences of people with severe mental illness: A replication. Psychiatric Rehabilitation Journal, 22, 46-50, 1998. Becker, D.R., Drake, R.E., Bond, G.R., Xie, H., Dain, B.J., & Harrison, K. Job terminations among persons with severe mental illness participating in supported employment. Community Mental Health Journal, 34, 71-82, 1998. Becker, D.R., Torrey, W.C., Toscano, R., Wyzik, P.F., & Fox, T.S. Building recovery-oriented services: Lessons from implementing IPS in community mental health centers. Psychiatric Rehabilitation Journal, 22, 51-54, 1998. Bond, G.R. Principles of the Individual Placement and Support Model: Empirical Support. Psychiatric Rehabilitation Journal, 22, 11-23, 1998. Bond, G.R., Drake, R.E., & Becker, D.R. The role of social functioning in vocational rehabilitation. In K. T. Mueser & N. Tarrier (Eds.). Handbook of Social Functioning in Schizophrenia (pp. 372-390). Boston, MA: Allyn and Bacon, 1998. Clark, R.E. Supported employment and managed care: Can they coexist? Psychiatric Rehabilitation Journal, 22, 62-68, 1998. Clark, R.E., Dain, B.J., Xie, H., Becker, D.R., & Drake, R.E. The economic benefits of supported employment for people with mental illness. The Journal of Mental Health Policy and Economics, 1, 63-71, 1998. Clark, R.E., Xie, H., Becker, D.R., & Drake, R.E. Benefits and costs of supported employment from three perspectives. Journal of Behavioral Health Services and Research, 25, 22-34, 1998. Drake, R.E. Supported Employment (Special issue). Psychiatric Rehabilitation Journal, 22, 1998. Drake, R.E. A brief history of the Individual Placement and Support Model. Psychiatric Rehabilitation Journal, 22, 3-7, 1998. Drake, R.E. Whither supported employment? Psychiatric Rehabilitation Journal, 22, 2, 1998. Drake, R.E., Fox, T.S., Leather, P.K., Becker, D.R., Musumeci, J.S., Ingram, W.F., & McHugo, G.J. Regional variation in competitive employment for persons with severe mental illness. Administration and Policy in Mental Health, 25, 493-504, 1998. McCarthy, D., Thompson, D., & Olson, S. Planning a statewide project to convert day treatment to supported employment. Psychiatric Rehabilitation Journal, 22, 30-33, 1998. McHugo, G.J., Drake, R.E., & Becker, D.R. The durability of supported employment effects. Psychiatric Rehabilitation Journal, 22, 55-61, 1998. Sengupta, A., Drake, R.E., & McHugo, G.J. The relationship between substance use disorder and vocational functioning among persons with severe mental illness. Psychiatric Rehabilitation Journal, 22, 41-45, 1998. Torrey, W.C., Bebout, R.R., Kline, J., Becker, D.R., Alverson, M., & Drake, R.E. Practice guidelines for clinicians working in programs providing integrated vocational and clinical services for persons with severe mental disorders. Psychiatric Rehabilitation Journal, 21, 388-393, 1998. Torrey, W.C., Mead, S., & Ross, G. Addressing the social needs of mental health consumers when day treatment programs convert to supported employment: Can consumer-run services play a role? Psychiatric Rehabilitation Journal, 22, 73-75, 1998. Bond, G.R., Becker, D.R., Drake, R.E., & Vogler, K.M. A fidelity scale for the individual placementand support model of supported employment. Rehabilitation Counseling Bulletin, 40, 265-284, 1997. Bond, G.R., Drake, R.E., & Becker, D.R. Integration dans la communaute des patients ayant des troubles mentaux severes. L’Information Psychiatrique, 8, 797-805, 1997. Bond, G.R., Drake, R.E., Mueser, K.T., & Becker, D.R. An update on supported employment for people with severe mental illness. Psychiatric Services, 48, 335-346, 1997. Clark, R.E., Xie, H., Becker, D.R., & Drake, R.E. The costs and benefits of supported employment: Can employment programs survive managed care? Paper presented at the Seventh Annual National conference on State Mental Health Agency Services Research & Program Evaluation, Arlington, VA, 1997. Harris, M., Bebout , R.R., Freeman, D., Hobbs, M., Kline, J., Miller, S., & Vanesse, L. Work stories: Psychological responses to work in a population of dually diagnosed adults. Psychiatric Quarterly, 68, 131-153, 1997. Mueser, K.T., Becker, D.R., Torrey, W.C., Xie, H., Bond, G.R., Drake, R.E., & Dain, B.J. Work and nonvocational domains of functioning in persons with severe mental illness: A longitudinal analysis. Nervous and Mental Disease, 185, 419-426, 1997. Torrey, W.C., Clark, R.E., Becker, D.R., Wyzik, P.F., & Drake, R.E. Switching from rehabilitative day treatment to supported employment. In L. L. Kennedy (Ed.). Continuum, Developments in Ambulatory Mental Health Care (Vol. 4, pp. 27-38). San Francisco: Jossey-Bass, 1997. Xie, H., Dain, B.J., Becker, D.R., & Drake, R.E. Job tenure among persons with severe mental illness. Rehabilitation Counseling Bulletin, 40, 230-239, 1997. Becker, D.R., Drake, R.E., Farabaugh, A., & Bond, G.R. Job preferences of clients with severe psychiatric disorders participating in supported employment programs. Psychiatric Services, 47, 1223-1226, 1996. Clark, R.E., & Bond, G.R. Costs and benefits of vocational programs for people with serious mental illness. In M. Moscarelli, A. Rupp & N. Sartorius (Eds.). Mental Health Economics and Health Policy (pp. 219-237): John Wiley & Sons Ltd, 1996. Clark, R.E., Bush, P.W., Becker, D.R., & Drake, R.E. A cost-effectiveness comparison of supported employment and rehabilitative day treatment. Administration and Policy in Mental Health, 24, 63-77, 1996. Drake, R.E., & Becker, D.R. The Individual Placement and Support model of supported employment. Psychiatric Services, 47, 473-475, 1996. Drake, R.E., Becker, D.R., Biesanz, J.C., Wyzik, P.F., & Torrey, W.C. Day treatment versus supported employment for persons with severe mental illness: A replication study. Psychiatric Services, 47, 1125-1127, 1996. Drake, R.E., McHugo, G.J., Becker, D.R., Anthony, W.A., & Clark, R.E. The New Hampshire study of supported employment for people with severe mental illness. Journal of Consulting and Clinical Psychology, 64, 391-399, 1996. Alverson, M., Becker, D.R., & Drake, R.E. An ethnographic study of coping strategies used by people with severe mental illness participating in supported employment. Psychosocial Rehabilitation Journal, 18, 115-128, 1995. Bond, G.R., Clark, R.E., & Drake, R.E. Cost-effectiveness of psychiatric rehabilitation. Psychotherapy and Rehabilitation Research Bulletin, 4, 26-31, 1995. Clark, R. Creating work opportunities for people with severe mental illness. (Response to “The economic advancement of the mentally ill in the community”). Community Mental Health Journal, 31, 397-401, 1995. Clark, R. Employment and security. (Response to “The economic advancement of the mentally ill in the community: 2. Economic choices and disincentives” by R. Warner and P. Polak). Community Mental Health Journal, 31, 493-498, 1995. Drake, R.E., Becker, D.R., Xie, H., & Anthony, W.A. Barriers in the brokered model of supported employment for persons with psychiatric disabilities. Journal of Vocational Rehabilitation, 5, 141-149, 1995. Torrey, W.C., Becker, D.R., & Drake, R.E. Rehabilitative day treatment vs. supported employment: II. Consumer, family and staff reactions to a program change. Psychosocial Rehabilitation Journal, 18, 67-75, 1995. Becker, D.R., & Drake, R.E. Individual placement and support: A community mental health center approach to vocational rehabilitation. Community Mental Health Journal, 30, 193-205, 1994. Drake, R.E., Becker, D.R., & Anthony, W.A. A research induction group for clients entering a mental health research project. Hospital and Community Psychiatry, 45, 487-489, 1994. Drake, R.E., Becker, D.R., Biesanz, J.C., Torrey, W.C., McHugo, G.J., & Wyzik, P.F. Rehabilitative day treatment vs. supported employment: I. Vocational outcomes. Community Mental Health Journal, 30, 519-532, 1994. Becker, D.R., & Drake, R.E. A Working Life: The Individual Placement and Support (IPS) Program. Concord, NH: New Hampshire-Dartmouth Psychiatric Research Center, 1993. Hampshire. Paper presented at The NASMHPD Research Institute, Inc., Fourth Annual National Conference on State Mental Health Agency Services Research and Program Evaluation: Proceedings, Alexandria, VA, 1993. Whitley, R., Kostick, K., & Bush, P.W. (2009). Supported employment specialist strategies to assist clients with severe mental illness and criminal justice issues. Psychiatric Services, 60,1637-1641.